Introducing a new lip protector concept in comfort for orthodontic braces! ComfortBrace is a clear adhesive strip that covers your brackets and helps prevent mouth sores and relieve braces pain and irritation. It looks similar to a Whitestrip, but unlike a Whitestrip it does not contain any whitening chemicals. Instead, it adheres gently to your teeth and brackets, forming a soothing protective barrier between your braces and the inside of your mouth. It is sheer and barely noticeable once you put it on and has a fresh mint flavor. You can eat, drink, and sleep with ComfortBrace strips in place. You can wear them all day if you wish; however, you should remove them to brush your teeth, as microscopic food particles can remain under the edges. They are "one size fits all," but if you need to, you can trim them with scissors before removing the adhesive backing. 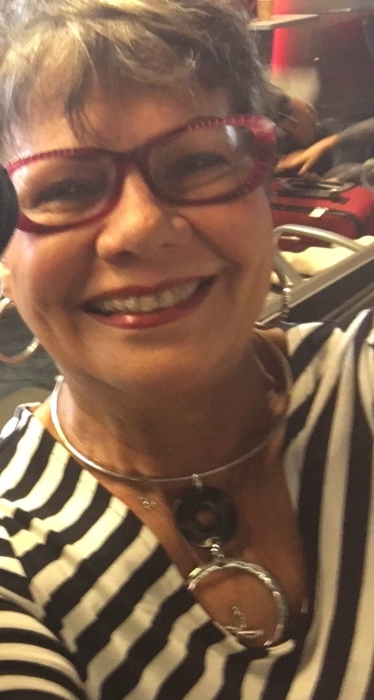 It's a great product for people in speaking positions whose braces are irritating their mouths, or any braces wearer who just wants to be a little more comfortable. 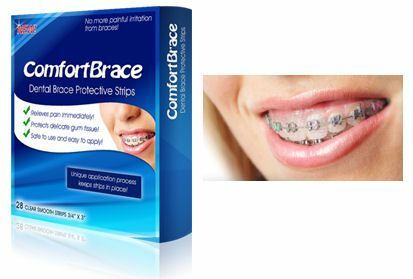 ComfortBrace strips do not contain any harsh chemicals and will not harm your teeth or your braces. They are latex-free, gluten-free, and BPA-free. Application of the strips is as easy as 1-2-3, as shown in the illustration at the left (click to enlarge). To remove the strips, simply grasp the edge and peel off. Then lightly brush your teeth to remove any remaining adhesive. Full instructions are included with the product. Please Note: If you live in a hot climate, or if you order this product during a hot time of year, we recommend that you refrigerate the product for 2 to 3 hours before using it, and keep it in a cool place. ComfortBrace strips are made from the same superior trade ingredients found in most dental products on the market today. Each box of ComfortBrace strips contains 24 individually foil-sealed strips. Each strip is meant for one use (they are not re-usable). Buy one box for $19.99, or two or more boxes at $18.99 each and save! Please note: This product (like all lip protector products) is not returnable due to health regulations. You get 24 individually foil-sealed strips. Each strip is meant for one use (they are not re-usable). ComfortBrace strips do not contain any harsh chemicals and will not harm your teeth or your braces. They are latex-free and BPA-free, and non-toxic. Ingredients: Carbomer 980, Hydroxyethyl Cellulose (HEC), Sorbitol, Polyvinylpyrrolidone (PVP), Polyethylene & Polypropylene, Acrylates Copolymer, Water, and Mint Flavor. Full instructions are included with the product. Please note: this product is not returnable due to health regulations. In hot weather, please keep ComfortBrace strips in an environment less than 80 degrees Fahrenheit, or store them in the refrigerator. We're so glad that someone was innovative enough to invent this product! Our customers have told us that they love it and that it works well for them. If you're on the phone or speaking all day, these lip protector strips can be a real lifesaver. Be sure to brush your teeth after taking them off, to remove any excess adhesive. Can I use them while playing basketball to protect my soft tissue from scrapes? John, The ComfortBrace Strips are meant to protect the inside of your mouth during regular everyday activities such as eating or speaking. We don't recommend using them for sports that involve contact, because they don't provide the type of impact protection that a mouth guard would. When in doubt, please consult your coach and/or your orthodontist. Can you eat and drink with them on? Yes, you can eat and drink with them on. Can you wear these over rubber bands? They would be worn directly on the braces, beneath the rubber bands. Does this product help to protect clear elastics from staining from food and drinks? Yes, it should help to some degree. However, clear elastics are difficult to keep free of stains. All colors of elastic stain from food, and there is nothing that will take the stains out (believe us, we've looked, and many ArchWired Metal Mouth Forum readers have unsuccessfully tried many different products to remove the stains). The best colors of elastic or power chains for hiding stains are light blue or light grey. Does your mouth or braces have to be dry in order for the strip to stick like the wax? Thanks for writing, Julia! Although it would be helpful for your teeth and brackets to be a bit dry when applying this product, it isn't totally necessary. ComfortBrace Strips contain a sticky adhesive which will work regardless of how dry your teeth or braces are (unlike Ortho-Sil silicone wax, which requires a dry environment to begin with). Really easy to use and you feel a difference when you have them on. It's soft for the lips. The adhesive has a taste, you'll have the flavor on your lips for a while. It depends on your teeth, how the strip adheres to them. In my case it wouldn't work well on my lower teeth. The strip comes off when eating or just after a while of having them on. On the top the strip works well and it's compeltely invisible. If you have braces, you need these! My cheeks were so ripped up by my brackets and wax was so messy. These are like teeth whitening strips without the chemicals and stay in place when I drink hot or cold beverages. I haven't worn them while eating, although they say you can. I didn't want to worry about swallowing them. They aren't quite long enough to go around the entire mouth, so I cut them in half and apply them where I have irritation and it allows my cheeks to heal. Great product!!! ConsIf they were made from a slightly more stiff material, they might be easier to apply to the gums way in the back - although that may affect their comfort level. These strips saved my mouth and let my sores heal. You can't even see them when they're on, but do come off when eating. It was well worth the money! I barely know that I have braces when wearing these. It did take me a few times of 'practice' to figure out the best placement for them. I now have it down to a science. For right or wrong I do wear them for 24 hours. I have learned that putting them on right before bed time works the best as they really get 'settled and stick' better if I am not talking or eating right away with them. So I brush and water pick etc at night and then only gently swish with mouth wash in the morning. I am able to eat with them - using a fork or spoon for everything vs. taking a bite of things (I never used to eat Pizza with a fork). I 'anchor' the back ends of the strips with a little bit of wax that I need to cover the pokey back bracket anyway and it really keeps them set. The product truly is amazing... just a bit expensive. This is the only product that works for me besides dental wax. I use it at night if my mouth gets too irritated during the day. It does have a funny taste, but it's not too bad. This product did not work very well for me. ConsSticky but did not stay in place. Thank you for saving my mouth! I was in so much pain from my braces and the simple things (like eating and sleeping) were rapidly disappearing from my world. I was a little dubious about ComfortBrace when i came across them online, but ordered them as i was really at my wits end. Now, I can't stop telling EVERYONE about them as they brought me instant relief. I can't understand why everyone isn't using them (instead of wax), as they're invisible, comfortable, cost effective and...THEY WORK!!! Thank you, thank you, thank you for inventing something so simple, yet essential. ConsFlavour fades after a couple of hours (but can be refreshed with mouth drops or mouthwash). It's a good product ! Sometimes get a bit loose! More comfortable than the wax! But wax protects better! Good when going in public! Or restaurants ! I purchased this product about two weeks before getting my braces installed. What I don't like about this products is it didn't stay on my teeth as long as I expected. I would say it stayed on my teeth for about no more then four hours. I had recently just gotten braces put on my bottoms row & I ordered these for comfort. When I excitedly applied to my braces, they did not stay in place for me, I kept getting spit bubbles (I have a saliva phobia) & I didn't like the taste of the adhesive or whatever substance that's under the strips. I haven't used them since. These are actually very helpful for me since I am allergic to the brace wax. The first box I bought would get a 5 star review. This order I received two boxes and one was defective. The adhesive was stuck to the packaging instead of the plastic strip. Therefore, less than half of them were of any use to me. Merchant Response:We were sorry to hear that one of the boxes was defective. We have sent a new box to you for your inconvenience. ProsThese really work and are quite helpful. Works well, but the mint flavor should be optional. I was super excited when this product arrived because I was tired of fooling with dental wax, but after using this product once, I went back to the wax. The thing I disliked the most was the mint flavor. It didn't taste good, and there was A LOT of it on the strip. Also, when you peel strip from its backing, it immediately rolls up on itself, making it difficult to undue. I ended up wasting the first strip because I wasn't prepared and I couldn't undue it when it rolled up on itself. It did give me relief once on though. Once it was on, the discomfort from my braces went away immediately, and I forgot about the product even being on.... I liked that. I also liked that I could eat and drink with it too, but the cons outweighed the pros for me. If it wasn't for that mint flavor, I'd be using this instead of the wax. The mint flavor should be optional. While the strip is on it provides the relief between my braces and sore mouth that I was desperate for. The strips are very sticky. You have to be very careful opening the package and peeling off the strip; even so, one end inevitable gets a little bunched up on itself. It adheres just as demonstrated in the video (which is a very helpful video). Mine have yet to make it through eating a meal or drinking hot beverages, but otherwise it stays on. I have worn a strip for hours even over night but I would say you could reasonable expect a strip to stay on a maximum of 10 hours (not 24 hours, as the product claims), and of course not nearly as long if you eat a meal while wearing one. Overall, a worthwhile product. I'm glad I have this in my little arsenal of products to help with braces pain and discomfort. I had pretty severe mouth sores and tenderness especially on my lower gums from ceramic braces. I'm 49 and not a complainer. Wax was bulky and difficult to take off quickly. This product almost eliminates the discomfort on my gums. I can definitely drink fluids and even eat some foods with the strips on. It doesn't affect my talking. I wish I would've had this product the first 2 weeks of my braces. I plan on using them throughout the course of my treatment, especially at night and also late afternoon, after talking all day at work. My orthodontist also liked the product after I showed him and plans on possibly offering samples in the clinic. ConsCould be a little less expensive. I am an office manager at our dental office. I had braces put on about six months ago by my orthodontist. I spend a lot of time at work talking on the phone or to patients. The brackets on my braces were extremely uncomfortable, causing sores. I found the product ComfortBraces online and thought I would try it. Instant relief! I do cut the strips down a little as I have a smaller mouth, but overall I find they are easy to use and the relief is wonderful. I have not been able to eat with these on, as they tend to come off as I'm chewing,otherwise they stay on very well and are not noticeable when talking. I wear them while I'm sleeping and have never had a problem with them coming off. As an adult it is definately worth the price, and no extra bulk like dental wax. I recently had clear ceramic braces put on and have been in misery ever since. Using wax is great for problem areas but the size of the ceramic brackets are larger and the inside of my mouth was completely raw and full of cuts. This product goes over your braces just like a White Strip and it sticks right to them creating a barrier between your brackets and your mouth preventing cuts, sores, and irritation. No problems eating, drinking, sleeping, or speaking and you cannot even see them on my teeth. I absolutely cannot live without this product! The only real cons is that they are somewhat big and you may have to cut them length and width wise. Also, they have a mint taste which is fine, but I prefer no flavor. Other than this, they are a lifesaving blessing! I'll be stocking up on many, many boxes over the next 12 months! This is a godsend - saves me a lot of pain!